A happy child is a healthy child, and that starts with the proper nutrition to get through the day. We provide wholesome meals for students in the district and meet the nutritional guidelines set forth by the USDA and other federal programs. We offer a free breakfast to all our students and affordable, healthy lunches for all. If you have any questions regarding our food service program, please contact our food service director, Paulina Bravo. 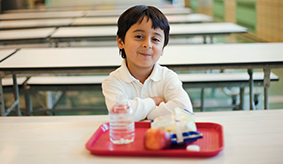 According to district policy (406.1), students may accumulate five lunch charges. After five charges, students will receive a peanut butter sandwich, fruit, and milk for $0.50 until charges are paid. If the cost of school lunches becomes a financial hardship, we encourage you to apply for free and reduced lunches. You can find the application at the side of this page. All enrolled students are eligible for free breakfast, while adults and non-enrolled children can purchase breakfast for $3.00. We know that even our low-cost lunches may prove a challenge for you. We encourage you to apply for free and reduced lunches to ease your mind.